Abstract: One of the more puzzling meanings associated with Czech habitual or iterative verbs is their tendency in past morphology to denote a distant past. Traditional, feature-based analyses of this verb form’s semantics cannot adequately account for the status of the distant past meaning. Other scholars see a link between the distant past tendency and the feature of indeterminate iterativity that is part of the verb’s core semantics—thereby making the verb’s behavior in past morphology coherent with its behavior in present morphology—although the exact nature of this link has yet to be adequately described. Using a corpus of examples taken from sources in contemporary literary Czech, I argue that the distant-past meaning is in fact only a tendency. Verbs of this type can be used to express a remote past, a past period of time which is ambiguous with regard to remoteness, and, in some instances, a more or less recent past. The key to making sense of this behavior is an understanding of remoteness as primarily conceptual and not merely temporal; temporal distance becomes one possible, even preferred, realization of the broader phenomenon of conceptual distance. The notion of conceptual distancing also provides an adequate explanation for the link between morphologically past and present usages of the verb since morphologically present usages, as inductive generalizations over a class of entities or events, naturally presuppose distancing. My analysis is grounded in Charles Peirce’s semiotic treatment of habit and Ronald Langacker’s cognitive grammar framework. 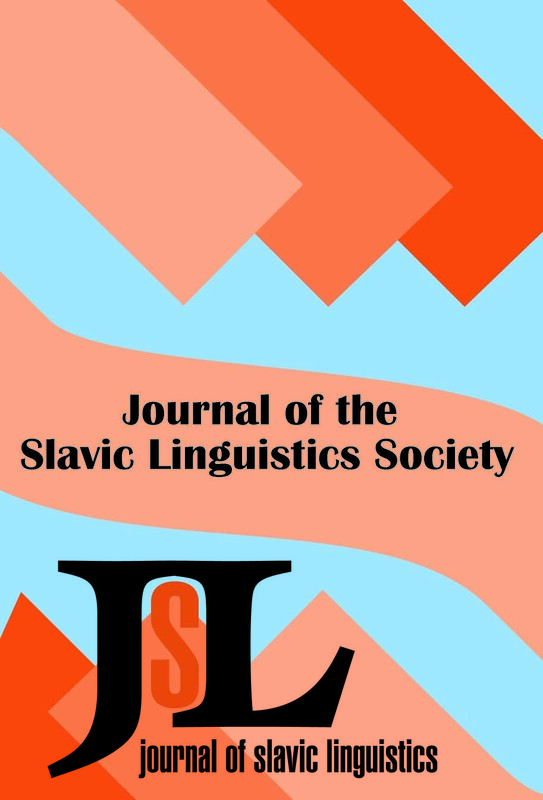 Abstract: This article presents a discussion of differences between the Slavic languages regarding the historical productivity of -no,- as an aspectual suffix. It is shown that a class of prefixed pf a-stem/n-stem doublets has been more productive in a group of western languages (primarily Czech, Slovak, Upper Sorbian) and that this productivity declines in the languages farther to the east, reaching a minimum in Russian and Bulgarian. Further, differences are shown regarding the function of -no,- as a perfectivizing suffix in some Common Slavic unprefixed pf verbs. These differences are then discussed, with no claims to an exhaustive analysis. Abstract: This article establishes the parameters governing choice of aspect in verbs of communication. The aspectual opposition under consideration is the imperfective general-factual vs. the perfective. Two types of pragmatic contract govern the communication: external contract, related to the expectancy of the communicative act, and the internal contract, which is part of the lexically-imposed expectation of the addressee’s communication and/or post-communication response. The non-fulfillment of either type of contract triggers imperfective general-factual. In addition, features of intentionality, consequentiality, and authority affect the choice of aspect. A section on performatives provides a taxonomy of aspectual uses and demonstrates that authority and reiteration are the key features. Abstract: Verbal predicates denoting situations which are located not simultaneously but retrospectively in time with respect to an absolute or relative “present” allow two fundamentally different intepretations: an actual one and a non-actual one. Each of the two possible interpretations is based on a different conceptual level. In the actual interpretation, a predicate refers to one or more concrete situations occupying a well-defined place in time and space; in the non-actual interpretation the predicate refers to the “type” of situation and thus to situations that are potentially locatable in time, but not related concretely on the time axis. This distinction between actuality and non-actuality—between reference to one or more “tokens” of a situation and reference to the type of the situation—is of primary importance for the category of aspect in Russian. Verbal predicates referring to actual situations can be presented from different perspectives by means of different aspectual forms—they allow a situation to be presented from an internal or an external perspective. In contrast, predicates interpreted non-actually involve a neutralization of the aspect opposition. In the latter case, only the imperfective aspect is acceptable and has no aspectual function, but functions merely as the aspectual genus proximum. This article shows that the distinction between actual and non-actual reference—between token- and type-reference—is also relevant for aspect usage in Who-questions. Abstract: In Upper Sorbian, as in the other contemporary West Slavic languages, itera-tive/habitual actions (acts or events) can be expressed by both imperfective and perfec-tive verbs. Aspectual competition in iterative contexts is therefore complete. Based on the results of a questionnaire that incorporated a variety of iterative contexts and that was administered to native speakers of Upper Sorbian in July-August 2000, the article demon-strates that a number of lexical, stylistic, and morphosemantic factors condition aspect selection by today’s native speakers of Upper Sorbian. This is shown to hold true across generational lines, whether today’s speakers of Upper Sorbian instantiate verbal aspect as a strict imperfective-perfective opposition; or whether—in the case of prefixed verbs and their stem-suffixed (formerly imperfective) counterparts—they instantiate a quasi-aspec-tual indeterminate-determinate opposition. The article thus counters claims made by some Slavists that verbal aspect in contemporary Upper Sorbian is obsolete, functionally restricted, or subordinate to other grammatical categories such as tense. Abstract: This analysis of the interaction of temporal quantifiers and aspect in Croatian and Serbian is based on examples containing the frequency adverbs rijetko, ponekad, cesto, uvijek and the repetitive adverbs dva puta/dvaput, tri puta/triput, nekoliko puta, vise puta, puno/mnogo puta and nebrojeno puta. Occurrences of these adverbial expressions in discourse are examined to see if and to what extent there is a correlation between repeated action and the notion of imperfectivity, and if the semantic differences between the analyzed adverbs make any difference in this regard. Some differences in the preference for the perfective in contexts of repetition in Croatian and Serbian are also discussed.